I've taken on a bit more than I could chew this fall - I've been tutoring 3 nights a week, babysitting (and delivering to school) a six year old several mornings a week, subbing as a dorm parent occasionally, doing a homework-heavy weekly Bible study, and doing all my usual mom stuff while Matt has worked the last 6 weekends in a row. (Yeah. 6. In a row.) And of course, what's fallen by the wayside is chores. Our house has been a disaster, which doesn't bother anyone except me, but it really bothers me. I'm changing my schedule to free up some time, but I also needed to implement some structure and accountability to my cleaning chores. 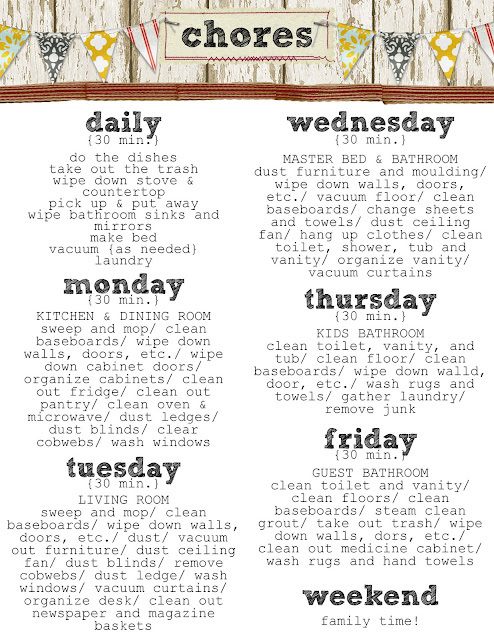 Enter this cute customizable chores printable from my3monsters, which I found via Pinterest. 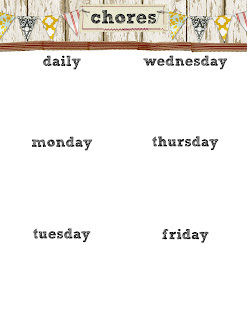 I thought about what I wanted to get done each week and divided it for the weekdays. My3monsters also has a chore chart with her chores on it, but it was CRAZY extensive. Like washing the walls crazy extensive. I don't have time for that - but my props to anyone who does. I edited the blank chore chart in picmonkey, then printed it on photo paper, stuck it in frame from the Dollar Tree, and hung it up on my kitchen wall. Accountability. Wow! Excellent idea! So proud of you! I should probably have something like your chart! Very impressed! I have always been impressed with how organized you are. Super job! !